The unique processing of object security by NetVisn provides the base view (what you can see in Cognos Connection) along with an Account view. This view translates security implemented through groups and roles into a display of security by account by applying permissions based upon memberships. 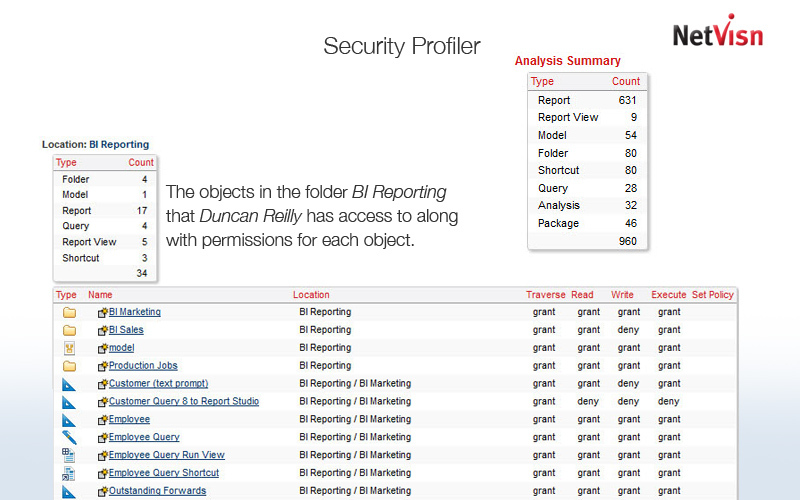 Security Profiler quickly and easily validates your security settings by showing permissions on all accessible objects and how they are derived. 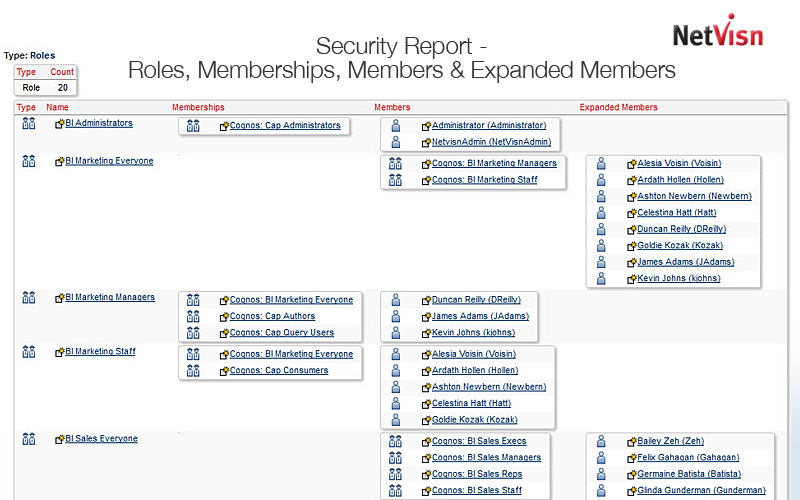 Security Report allows you to identify all groups and roles each user is a member of, and all the direct or expanded memberships of groups and roles. Plus, you can change security in NetVisn. Object security in Cognos in based upon inherited and overridden security so knowing where to modify security in the content hierarchy is critical. When viewing an object in NetVisn you will know the ancestor object and the permissions which are inherited. 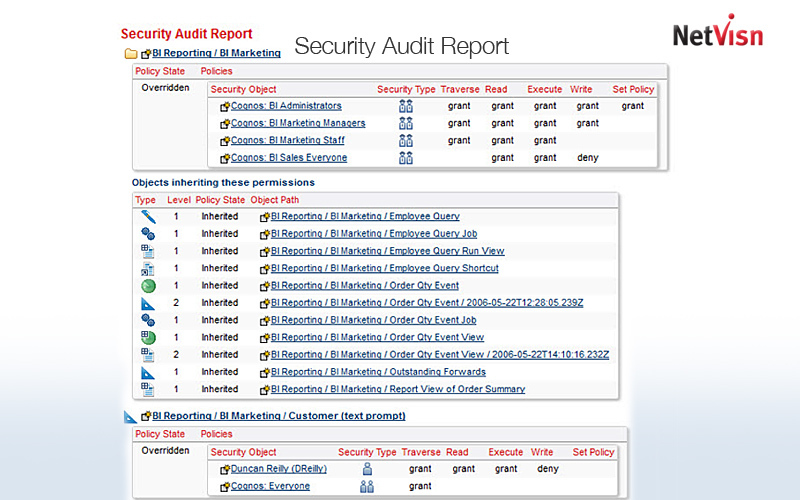 Security Audit report offers a hierarchical view of content with overridden security and descendant inherited objects. What you need to see - all in one place. Report of Roles, Memberships, Members and Expanded Members. Analysis can be done for all Namespaces or selectively by Role, Group, etc. This report shows the memberships of all Accounts in the Namespace. 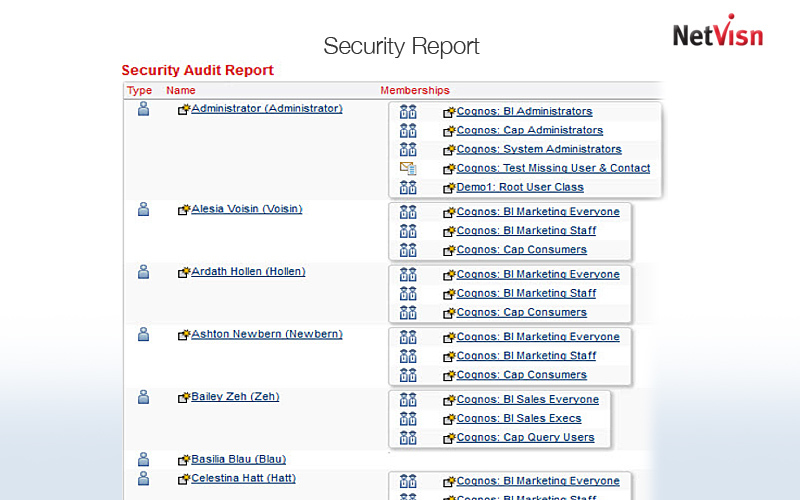 Security reports for Accounts, Roles, Groups, etc. are flexible enabling the user to get the information needed in a useful format. Report of object security grouped by object with overridden security. For the folder: BI Marketing. Security Profiler shows all objects that a security object has access to. In this example we see a summary of objects that user Duncan Reilly has access to. 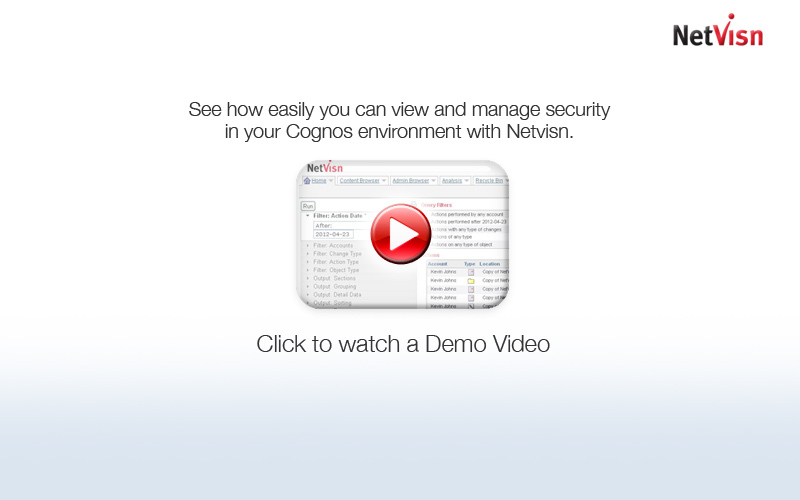 Related Article: Cognos Security – When is it Time to Start Over?